On Wednesday, Oct. 29, the second anniversary of Hurricane Sandy, the Coney Island History Project presents "Coney Island Creek After Sandy: Planning for the Future." Will the Creek be a community asset or a liability? 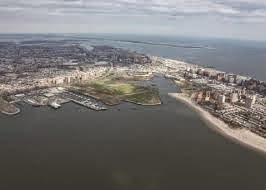 Charles Denson, director of the Coney Island History Project, will offer some answers to that question in a talk and film presentation at 6 p.m. at the Coney Island branch of the Brooklyn Public Library at 1901 Mermaid Ave., at the corner of West 19th Street. The event is free and open to the public. Denson, a Coney Island native, has been documenting the Creek for more than 40 years, giving many lectures and presentations at the New York Aquarium, The Coney Island Library, Kingsborough College, Brooklyn College, and other venues. In 2013 Denson received the Coney Island History Project Blog » Blog Archive » NYSMEA Presents Herman Melville Literary Award to Charles Denson from the New York State Marine Education Association for his contributions to marine education.